You may not realize this, but this petticoat is not a skirt. Yes, let us repeat that: not a skirt. We once made the mistake of thinking it was and spent five hours at the annual party showing our derriere to anyone who so much as glanced in our direction. That's a lesson we most certainly will never forget. Yes, this actually goes under your skirt instead, to make it poofy like so many classic looks. And this is especially perfect if you'd like to show off a fun skirt but want to stay conservative. Not as many petticoats are going all the way down to the knees these days, right ladies? You don't have to answer that. 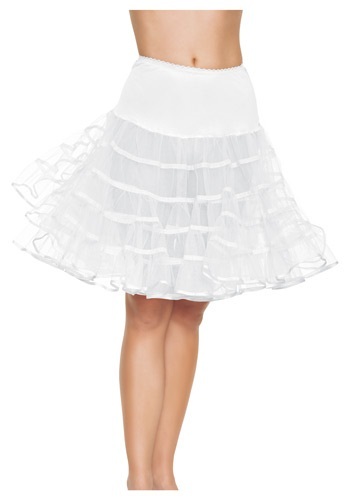 So slip in to this knee length white petticoat (with an incredible two layers of tulle) to add that oopf to any dress. There's nothing else like it to accentuate your elegance as you kick up your heels and shake your booty at any social gathering. Knock 'em dead!